London designers Blustin Heath have designed a cardboard interior for the Magma Art Bookshop. 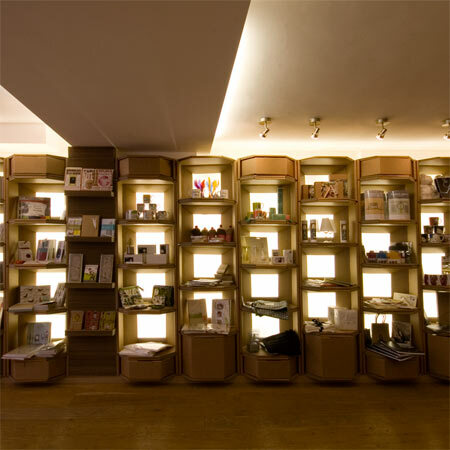 Completed in August 2007 on Earlham Street in London, the entire shop including shelving systems, counter surfaces and changing rooms is made from treated cardboard. Elements can be replaced simply and cheaply. Description of project: We designed the first product store for Magma Art bookshop using only cardboard as the construction material throughout. The main display wall was conceived as a flat pack system – it folds into an easy to assembly solid, sculptural display system. Therefore it can be altered, added to or replaced simply and cheaply. The main counter used folded cardboard to provide a strong piece of furniture with all the complexities of storage, cash register and display cases. Finally the rear area was conceived as the grotto and as such a complex geography of cardboard has been created. By laminating and gradiating the cardboard we have formed a dense display room. Finally downstairs the changing rooms are constructed from sliding and fixed panels of cardboard tubes.